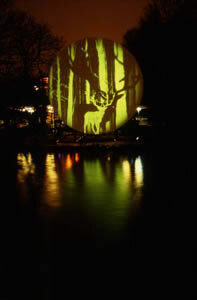 This work was shown from the 9th of March until the first of April 2001 on an 8 meter high screen at the Vondelpark in Amsterdam. 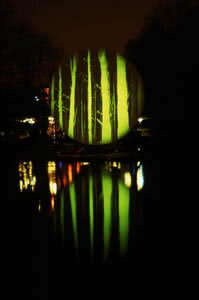 At the edge of a large pool you could see a green image of the park at night, resembling something seen through night-vision goggles: so that details that normally cannot be seen become visible. On and between the trees you can see all kinds of shadows. Mysterious dark spots eventually resolve themselves into a shadow play. Finally you can see what caused these shadows: a deer trying to find his way through the trees. 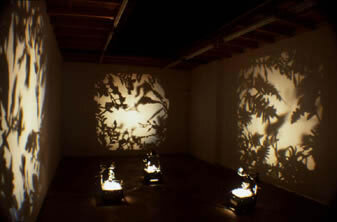 In this work the screens of three overhead projectors are covered with pieces of newspaper. Some headlines of the newspapers can still be read, describing oil spills, DNA experiments, and other disasters caused by mankind. The pieces of paper are being moved by small motors, which are attached to the projectors. There are also small ventilators that make the newspaper fragments move. The shadows of these newspapers form three black and white landscapes on the walls of the room. The landscapes are like a trompe l'oeil. In the landscapes all kinds of plants, birds and insects fly around . The landscapes form a paradisical garden in the space. 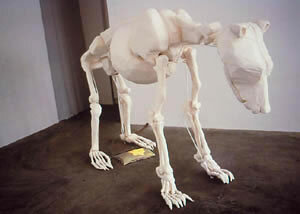 The work measures 160 x130 x 40 cm and shows a very thin bear. 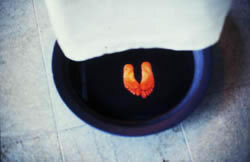 The separate body parts are made of white cloth. 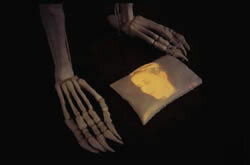 Between his back feet lies a pillow on which there is projected a video of a sleeping woman. 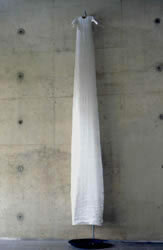 The work measures 410 x 270 x 600 cm. The viewer is confronted by a large barbed-wire fence. Behind the fence are plants and some TV monitors. 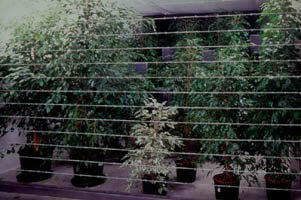 The fence blocks the way to the plants so that no physical contact with the other side is possible. 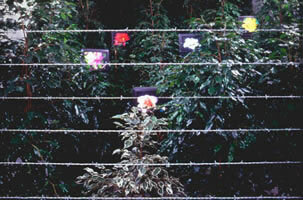 The spectator can only look at the plants through the barbed wire. When the viewer comes close to the fence and touches it, he will find out that the barbed wires also function like the strings of a harp, each producing a different note. This activates the monitors so that flowers appear. The flowers open and close as if they breathe on the sounds of the strings. By touching the strings the garden shows its secret flowers. When the viewer stops playing the wires the flowers disappear. 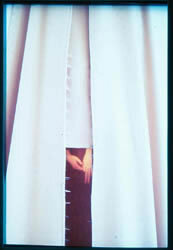 This work measures 280 X 150 cm and shows a long brown coat. On the outside of the coat a pattern of small metal flowers can be seen. When you look inside the coat you can see that the flower pattern on the coat is made by thousands of needles, which have been pushed into the fabric. Inside the cape you can see two hands trying to find their way between the needles. 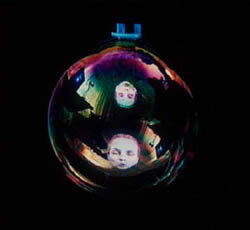 This work shows a video-projection of a soap bubble. In the bubble you see a woman's face. Apparently not aware of the threatening bang, she whistle's the song: "We"ll meet again." When the bubble bursts, both face and song disappear with it. After a while the same process begins in a new bubble. 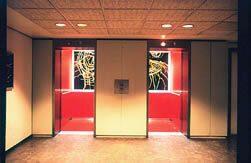 This work was made for a lift shaft in the City Hall in Amsterdam. 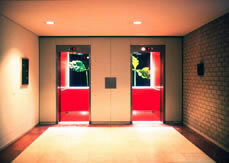 Two photographs, each measuring 600 x 160 cm, were installed on the back wall of the lift shaft. 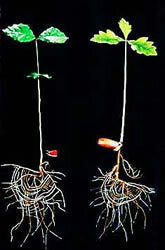 Each photograph shows a germinating seed, one of an oak tree and the other, a beech. The windows of the lifts look out onto the walls of the lift shaft, and reveal different sections of the photos as they travel between floors. From the cellar you can see the roots. Although each tree grows differently, the roots of each form a map of the canals which form the structure of the city of Amsterdam. As you move up to the first floor the leaves come into view. They seem to be reaching up to the light that comes into the lift shaft on higher floors. This work measures 360 X 30 X 25 cm. 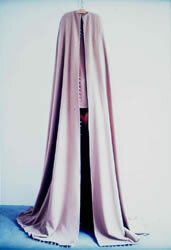 It shows a tall satin dress. The top of the dress is small like a child�s dress, but at the bottom it becomes wider. Under the dress there is a bowl of water. In the water you can see a reflection of the inside of the dress, which shows a pair of feet. The feet just rub gently against each other. 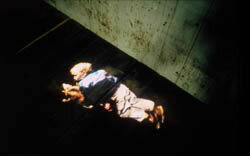 This work is called: "To play possum" and shows a 16mm film projection on the floor of the space. A small boy lies on the floor with his face to the ground. Next to him lies a small opossum which is as still as he is. "To play possum" is an English expression relating to the very strange behavior of an opossum in danger. When the opossum is in a situation which looks quiet hopeless he throws himself on the ground as if he was dead, in a last attempt to survive the situation. The film is an endless loop. 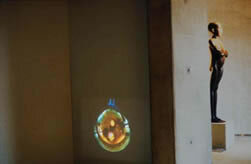 This work shows a life-size 16 mm film projection on the wall of the exhibition space. 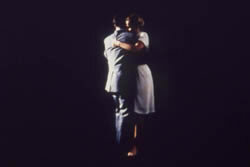 The projection shows a man entering the room from the left-hand side. From the other side a woman comes into the room. She walks towards the man and stands on his feet. Together they try to dance. After a while, once they have completed the dance, they leave the space again. *Institute: MK-Expositieruimte,When summer has almost gone.